Theresia Gschwandtner, MSc., MSc., PhD. Margit Pohl, Associate Univ.-Prof., PhD., MSc. This project is funded by the Austrian Federal Ministry of Science, Research, and Economy (formerly known as Austrian Federal Ministry of Economy, Family and Youth) in the exceptional Laura Bassi Centres of Excellence initiative, project number: 822746 (Phase 1) /840262 (Phase 2). Due to the proliferating capabilities to generate and collect vast amounts of data and information we face the challenge that users and analysts get lost in irrelevant, or otherwise inappropriately processed or presented information. This phenomenon, commonly known as information deluge, overwhelms traditional methods of data analysis such as spreadsheets, ad-hoc queries, or simple visualizations. At the same time, intelligent usage of increasingly available data offers great opportunities to promote technological progress and business success. On this score, Visual Analytics is an emerging research discipline developing methods and technology that make the best possible use of huge information loads in a wide variety of applications. The basic idea is to appropriately combine the strengths of both, computers' and humans' information processing capabilities. To make complex information structures more comprehensible, facilitate new insights, and enable knowledge discovery, methods of visualization, intelligent data analysis, and mining form a symbiosis with the human user via interactive visual interfaces. 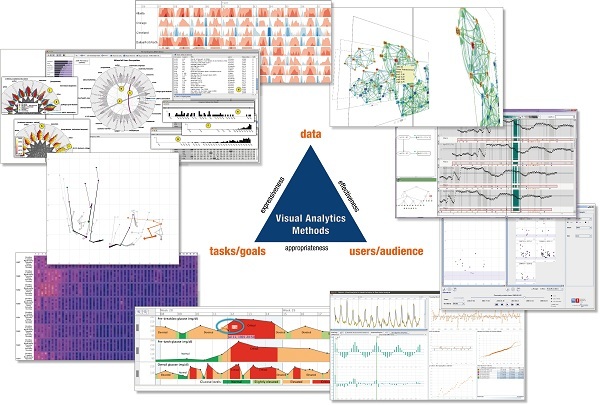 The goals of the Centre of Visual Analytics Science and Technology (CVAST) are twofold. The first goal is the integration of the outstanding capabilities of humans in terms of visual information exploration with the enormous processing power of computers to form a powerful knowledge discovery environment. The second goal is to scientifically assess the usability and utility of such discovery environments while bridging the gap between theory and practice for selected application scenarios.